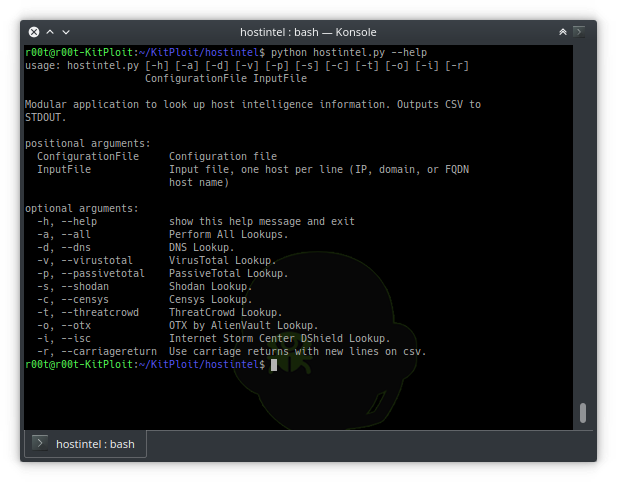 This tool is used to collect various intelligence sources for hosts. Hostintel is written in a modular fashion so new intelligence sources can be easily added. This works with Python v2, but it should also work with Python v3. If you find it does not work with Python v3 please post an issue. -a, --all             Perform All Lookups. -o, --otx             OTX by AlienVault Lookup. -i, --isc             Internet Storm Center DShield Lookup. -r, --carriagereturn  Use carriage returns with new lines on csv. You should be able to import myoutput.csv into any database or spreadsheet program. Note that depending on your network, your API key limits, and the data you are searching for, this script can run for a very long time! Use each module sparingly! In return for the long wait, you save yourself from having to pull this data manually. You can get API keys at the sites below for your configuration file. Crude notes are available here.